S3’s Amazon Glacier is a case in point. Amazon describes Glacier as “. . . a secure, durable, and extremely low-cost cloud storage service for data archiving and long-term backup.” Amazon Glacier in essence cold storage and can be useful and cost effective for customers who have large archives of files that are seldom accessed but which must remain available for years. The cost advantages of storing these files on Amazon Glacier are compelling. You can check the comparison of costs when compared to similar S3 data sets using the Amazon Web Services Calculator. Amazon Glacier is activated on S3 with Lifecycle rules that tell S3 which files should be moved to Amazon Glacier. Once those rules are in place, S3 will automatically move the files that qualify from conventional S3 storage to Amazon Glacier storage, leaving only a stub in the S3 bucket. 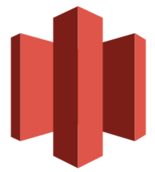 With Amazon Glacier – unlike conventional S3 storage – files (objects) are not available on demand. When you request a file that has been moved to Amazon Glacier, up to 24 hours may pass before the file becomes available and depending on how many files are retrieved it could be costly to activate the retrieval as Amazon Glacier is premised on minimal retrieval of datasets. Customers can activate a File Fabric™ feature that let’s them choose Amazon Glacier support when configuring an Amazon S3 provider. When Amazon Glacier support is turned on, the File Fabric™ keeps track of which files are stored conventionally on S3 storage and which files have been moved to Amazon Glacier and so are no longer immediately available. The Web File Manager decorates the icons for Amazon Glacier files with a distinctive symbol so users can easily tell which files have been moved by S3 to Amazon Glacier. Icons indicating Amazon Glacier files in SME’s Web File Manager. To access an Amazon Glacier file the File Fabric™ user double clicks on it in the File Manager. The File Fabric™ will automatically register a request with S3 to have the file restored from Amazon Glacier. When the file has been restored, the File Fabric™ sends an email to the user who requested the file. That email contains a link for downloading the file. Example of email with link to Glacier file. Glacier support is available to all on-premises and IaaS Appliance users. 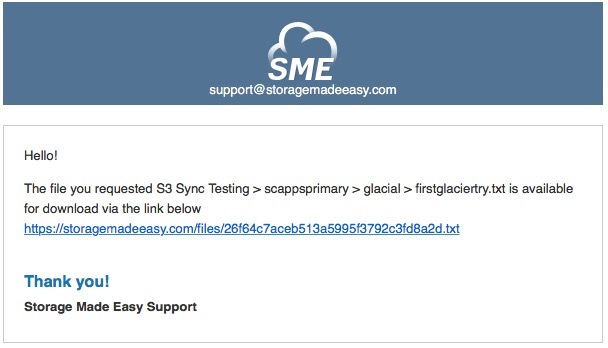 If you are a File Fabric™ Appliance customer and you want more information about how to use Glacier with SME please contact us. Dan has been working with Storage Made Easy's founders since the company was launched.